In race 1, Bill Lawson and Colette Preis worked into the lead on the first beat and extended for a comfortable win. Race 2 saw Spencer McAllister, sailing in the Class-owned boat, 9575, get off the starting line clean, sail up the left side of the first beat, catch the shift at the wind line, and round the weather mark first and extend over the remainder of the course for a bullet. In race 3, under the I flag, Spencer reached down the line, did a dip at the end and had a beautiful start at the pin, only to be notified part way up the weather leg that he had been called over early. Oops. Bill Lawson took the win in race 3. Race 4 was the crew race. Hayley Jenkins took the helm from Alan Campbell, got a clean start and sailed smartly for a convincing win. Liam Edgell sailed Spax with Sandy McAllister as the only other boat that had a crew willing to sail in the tricky conditions. This year, we had a single-handed division, allowing skippers with no crew to sail solo without adding ballast. The fleet was started together and scored together but the solo sailors who weren’t up to weight were theoretically then scored in their own division. As the breeze was up at times, sailing solo wasn’t as advantageous as having a crew. This commemorates the thirtieth anniversary of the “end-of –season” home style Penguin Frostbite, first dreamed up by Bill and Barb Lane and David and Julie Cox who approached Bill’s parents, William and Alice Lane and suggested they host a regatta at their house on the Upper Miles River. 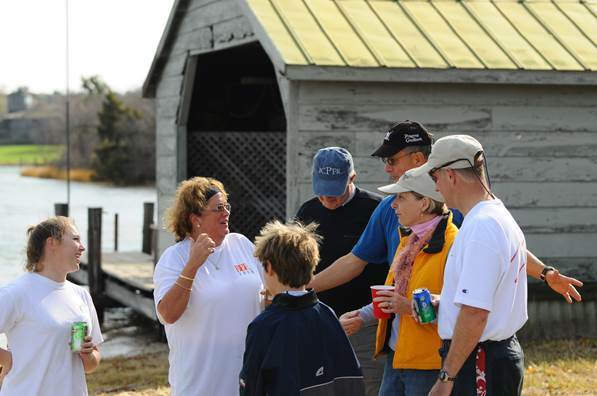 The name, UMPFR was coined and approximately 12 boats showed up for the inaugural event, with William Lane Sr. running the races off their dock. The event quickly grew in popularity, attracting over 30 boats at its peak. After 15 years, the time had come for the event to find a new home, as Alice Lane’s health had declined. She passed away a short while after the last event was held at their home. The Corkran family stepped up, and hosted the Penguin sailors at the family homestead on the Island Creek. The event name was changed to the ICPFR (or affectionately termed the icey-puffer), and the low key event, which typically coincided with Kim Corkran’s birthday, which is in mid-November, became a spectator draw with raw and steamed oyster, wood bonfires, and lots of opportunity for spectating – they even installed bleachers one year, as the race course was easily seen from the property. A staple of the ICPFR were the hats, a different color each year, given to each competitor, as a memento of the event. After ten years, the Corkran’s were ready to pass the baton. As Kim recounted, she and Henry .. were on Jim Thompson’s boat in the Mediterranean and Jim summoned her below. Kim thinking she had made some horrible faux pas, was quite concerned what this was about. Jim stated as how he knew they were looking for a new venue for the ICPFR event, and offered up his place on Bailey’s Neck. The event would now be known as the TCPFR, or Trippe Creek Penguin Frostbite. In 2018, we have just completed the fifth, with a total spanning 30 years, from 1989 – 2018. Now those who received a commemorative hat will notice a discrepancy here as the hats have 1988-2018 embroidered on them. A slight math error, but make no mistake, for the past thirty years this event has been the most well-attended Penguin event in the Penguin universe and is part of the glue that keeps Penguin sailing alive on the Chesapeake. Pucky Lippincott explaining the incident that led to Puck-up award to its creator, Paul Hull, and a group of onlookers, as Laura Biegel, the skipper who sent Pucky overboard, looks on. Sandy McAllister demonstrating to his crew, Jen Edgell, at ICPFR 10 the advantages of a self-rescuing Penguin.